If you are a conspiracy theorist, you might believe this match was fixed for Juve. The irony of the soft penalty and the late goal by Amauri, of all people. And with the schedule favoring them, they play later so they know what they need to do. If you believe in Karma, maybe it was that soft penalty and all of those fouls that came back to haunt us. Or if you’re like me, you may believe that a cracked vase can’t hold water forever. Exhaustion and injury have to punish us at some point. Whatever you believe, this match was like a Purple Haze that slowly turned into a nightmare. Milan started slow, which is always ominous. The 4th minute saw a Jovetic warning shot that went just wide. The 7th saw our captain mixing it up on a foul and then nearly getting in a fight with Pasqual, yellows for both. Ambrosini will miss Tuesday’s match away to Chievo. Perhaps also wanting a break, Bonera then earned his yellow in the 11th, also missing the trip to Verona. The resulting free kick by Ljajic went over the crossbar. After Nocerino was called for his second offside in the 15th minute, in the 18th minute, Ibra took a free kick that forced a great save by Boruc, and Muntari excitedly shot with the rebound, but sent it over the crossbar. In the 24th, Behrami got a shot off that was wide, then in the 30th, Nastasic earned himself a yellow for a foul on Maxi Lopez in the box. Although it looked to be a very soft one, the ref gave the penalty to Milan. Ibra took it, 1-0 Milan. Ambrosini made a very risky challenge in the 33rd, already being on a yellow. Then Ljajic took a beautiful free kick that forced Abbiati into a fantastic save in the 34th. Maxi Lopez had a great shot that only the post kept out, he was so unlucky not to score today. In the 40th, Jovetic took another shot that went wide, and then Ibra took a shot in the dying minutes of the half that went over the crossbar. The second half sent us into a panic when in the 47th, Jovetic scored the equalizer. Abate, having kept Jovetic onside, tried to make up for it in the Milan offensive flurry. First he tried a one touch shot that was blocked, and then, on a run forward was called for offside, even though he looked like he was actually on. Shame. What looked like an injury to Ambrosini seems to have forced Allegri into an early substitution with Aquilani coming on for him in the 53rd. Jovetic had another great shot in the 54th that was saved by Abbiati. In the 59th, Maxi Lopez had another shot just wide. Then in the 62nd, in an apparent tactical move, he brought on Robinho for Urby Emanuelson. In the 65th, off of a corner, Ibra crossed the ball high, but it unfortunately curled just out of bounds, even if Maxi Lopez took the resulting shot & put the ball in the back of the net. Since it had gone over the line, no goal. Tough break again for Maxi. Boruc literally had his hands full with Maxi Lopez today. The 67th saw us trading shots again – Jovetic forcing another nice save from Abbiati, then Maxi Lopez forcing a point blank save from Boruc at the other end just 2 minutes later. De Silvestri took a chance in the74th, Abbiati grabbed it, and in the 77th, Maxi fouled Boruc on yet another attempt on goal. The substitution of Amauri for Ljajic seemed strange, as Amauri was pulled from the starting lineup after struggling with injury all week. The 80th saw a shot by Aquilani cleared by Nastasic, and then another Ibra free kick saved by Boruc. In the 81st, Robinho also had a shot saved by Boruc. Aquilani then apparently decided to join Ambrosini and Bonera in taking Tuesday off by suspension as he earned himself a yellow card in the 82nd. 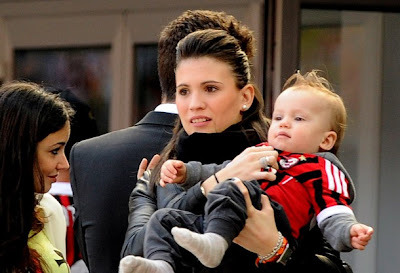 Carolina and Christopher Cassano in the stands to watch Fantantonio's return. One of the few bright spots in this match was the substitution of Cassano, who came on for Zambrotta. The down side of that substitution being that, already playing with 3 strikers, which hasn’t worked for us before, now Allegri was going all out with no fewer than four strikers. The defensive side of that decision showed 5 minutes later as Amauri, who literally hasn’t scored in a year, scored on a counter attack. 2-1 Fiorentina. In the 91st, Boruc was given a yellow card for timewasting. And in the 93rd, Cassano was brought down in the box, but no call. Ibra also had an argument for a penalty, but in addition to having given the soft penalty earlier, no ref in their right mind was going to give a penalty in stoppage time like that unless someone died. With a barrage of attacks, Ibra was called offside in the 95th, and that was the end of this Purple Haze. Not even sympathy points were going to get a penalty called in stoppage. In the end, Milan have only themselves to blame, with 63% possession and 21 shots, only 5 were on target. Boruc withstood a barrage of attacks in the final minutes that would have given anyone PTSD. 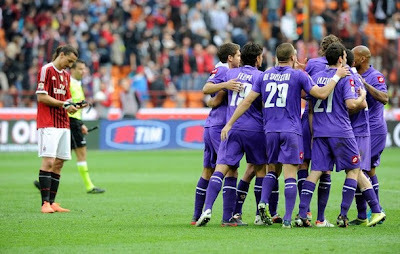 But it was Fiorentina’s stamina and efficiency that won them this match. With only 12 shots, they also had 5 on goal, and they weren’t given a penalty. I suppose that fighting for your Serie A life means more than just trying to survive the season and maintain a narrowing lead. So we’ve taken ourselves out of the driver’s set, pending the result of the Juve match that will start around the time this is posted. Now we have to wait and watch if maybe a former Milan player can come and haunt Juve like Amauri did for us. Every match is important at this point, and the weariness of having played 45 matches combined with injury Armageddon may have finally caught up to us. But we are not out of the race, and I still believe in Milan. Let’s hope we can shake off this Purple Haze and go punish some flying donkeys on Tuesday. 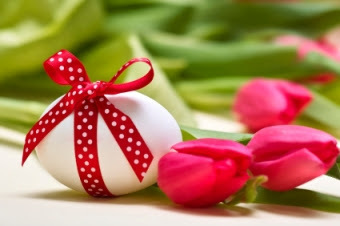 Here is hoping that those of you who are celebrating this holiday weekend have a wonderful one filled with food, friends, family, and high hopes for Tuesday.